#1 Reforesting to support ecotourism projects. Some community or familial organizations solicit our support to reforest their plots in order to encourage ecotourism. Hereinafter are some examples of this quite specific reforestation. Pedro AGUINDA‘s Paicawe lagoon is an island surrounded by low water flow rivers. This familial project allows the replenishment of an ecosystem similar to deep Amazon ones, at less than 100 meters far from the road. Lots of nature lovers come there to make paddle canoe tours and observe a multitude of free wild animals. The tour can be taken indifferently day and night. 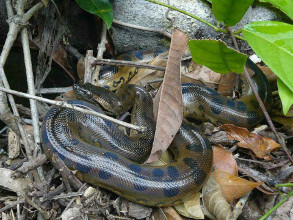 It’s possible to see 4 different monkey species, agoutis, capybaras, armadillos, anacondas, turtles, caimans, freshwater fish species and different kind of bird species such as hoazins which naturally came to nest and breed in the reserve. In 2014, Ishpingo foundation brought help to this project by reforesting the island with fruit trees in order to provide to wild animals food sources similar to what can be naturally found within rainforest. Lots of wood lumber trees have been planted as well to create a natural habitat suitable for animals breeding. Marco LUGO proposes a medicinal and spiritual tourism based on a plant called ayahuasca. It is suitable to people who wants to deepen self-understanding, to people suffuring from incurable disease or psychological disorder. The « treament » is closely monitored by a Shaman. The environment should be favourable to rest and pondering. To create a pleasant and comforting atmosphere we have planted a plethora of trees and plants around the lodge. 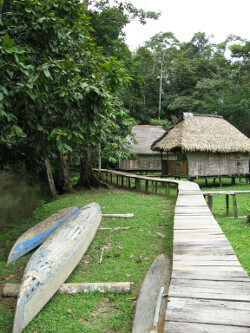 The Sinchiwarmi community center for Kichwa culture preservation and dissemination proposes different activities : traditional Kichwa dancing show, looking for gold in the river (without using mercury amalgam nor dangerous chemical products), crafting necklaces or wristbands with seeds, preparing the chicha (drink brew with cassava), discovering the museum of traditional hunting and fishing techniques. We set up an agroforestry plantation close to this museum in order to help them develop their ecotourism business. While visiting the plots, the women guide group may explain how the community exploits those lumber and medicinal trees. The fruits found during the tour can be tasted or used to prepared fresh fruit juices. In a similar way we’ve also supported other ecological lodges in the area such as : the Shiripuno community lodges, the Shandia community lodges as well as the lodges of Eduardo ANDI‘s family in Cando. #2 An important issue for forest preservation. Unlike classic mass tourism, ecotourism has basicaly been developed to let the slightest possible footprint on the environment. Tourism professionals try to preserve biodiversity and fight to replenish ecosystems by practising reforestation. The sustainable side of ecotourism is of particular interest to Ishpingo foundation for two reason. Firstable, since local population have got an income from it they become the strongest defenders of the nature and its biodiversity. Secondly because ecotourism is an opportunity to raise the awareness of the tourists to the necessity of preserving the natural heritage of our planet. However there are some abuses related to the fact that ecotourism generates an important financial flow. Today ecotourism still involves the construction of heavy infrastructures such as airports or high-end hotel complexes which cause the destruction of the very ecosystems the tourists want to preserve. Recently one can notice the emergence of the mass ecotourism paradox. With a great deal of fossil energy (4×4, quad, helicopters, planes, etc…) the tour operators alert the tourists to the danger of global warming… while badly contributing to it. The main issue lies in being able to heighten awareness of all the sector. Ecotourism needs a framework at the international level in order to properly inform the tourists about the real impact their trip is going to have on the environment. Then and only then ecotourism would be able to serve its prime purpose which is protecting and preserving ecosystems and biodiversity while revealing the wonders of the world.